In recent years, increasing attention has been focused on the safety of fruits and vegetables, and in particular on the intervention methods to reduce and eliminate human pathogens from fresh produce. Traditional technology utilizes water with or without a sanitizing agent to wash fresh fruits and vegetables. Chlorine is the most widely used sanitizing agent available for fresh produce, but it has a limited effect in killing bacteria on fruit and vegetable surfaces. The most that can be expected at permitted concentrations is a 1 – to 2-log population reduction. Furthermore, the environmental and health communities have expressed concerns about the residual by-products of chlorine. Ozone, as an alternative treatment is now being used to improve food safety. Research and commercial applications have verified that ozone can replace traditional sanitizing agents and provide other benefits. The validation of the use of ozone in the produce industry continues to grow. In the past two decades, the consumption of fresh fruits and vegetables in the U.S. has dramatically increased. In the meantime, the incidence of food borne illness due to food pathogens, chemicals, and wastewater has greatly increased. The has been drawing significant public and government attention. The number of produce-associated food borne disease outbreaks and the number of cases of illness due to food pathogens have significantly increased in recent years. Moreover, losses in the fresh produce industry that are attributable to microbial spoilage between the time of harvest and consumption are estimated to be as high as 30%. 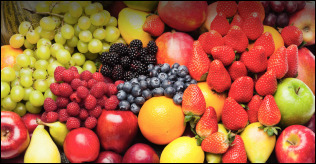 Chlorine is commonly used in the fresh fruit and vegetable industry to improve microbiological quality and control pathogens. However, many research studies have indicated that it is limited in its ability to kill bacteria on fruit and vegetable surfaces. Environmental and health organizations have expressed concerns with traditional sanitizing agents with respect to the formation of by-products, such as trihalomethanes (THMs) and other chemical residues formed in the wastewater returned to the environment. The produce industry is concerned about the possibility of future regulatory constraints on the use of chlorine as a sanitation agent. Large amounts of pesticides have been used annually to control insects on fruits and vegetables. Current technologies cannot totally destroy the chemical residues on the surface of fruits and vegetables. These chemical residues may react with pesticides to form chemical by-products. These residues ultimately will be consumed by customers and may directly and indirectly affect public health. An accumulation of toxic chemicals in the environment has increased the national focus on the safe use of disinfectants, sanitizers, bleaching agents, and other chemicals in the food processing industry. The produce industry is one of the largest and most important contributors to the world economy. It also generates billions of gallons of wastewater annually, with very high concentrations of bio-chemical oxygen demand (BOD) and chemical residues each year in the U.S. These waste waters have been linked to many serious problems such as cancer, fish death, water pollution, psychological and physiological diseases, and ecosystem damage. Moreover, the produce industry is paying heavy charges and surcharges for discharging wastewater into public water and wastewater treatment systems. In response to the public concerns about food safety, the President of the United States and Congress issued a new federal initiative in 1997 – the President’s Food Safety Initiative – to improve the nation’s food safety system and our environment. One of the approaches to improve food safety is to identify an alternative sanitizer to replace traditional sanitizing agents which can also be used to treat or recycle food processing wastewater. Research and commercial applications have indicated that ozone can replace chlorine with more benefits. In 1997, ozone was self-affirmed as Generally Recognized As Safe (GRAS) as a disinfectant for foods by an independent panel of experts sponsored by EPRI. This self-affirmation was timely for the produce industry in light of the President’s Fruit and Vegetable Safety Initiative. The produce industry is very interested in the use of ozone and would like to know how, when, and where to apply it. The potential utility of ozone in the produce industry depends on the fact that as an oxidizing agent, it is 1.5 times stronger than chlorine and is effective over a much wider spectrum of microorganisms than chlorine and other disinfectants. Ozone kills bacteria such as Escherichia coli, Listeria, and other food pathogens much faster than traditionally used disinfectants, such as chlorine, and is free of chemical residues. Ozone is a high-energy molecule. Its half life in water at room temperature is only 20 minutes, and it decomposes into simple oxygen with no safety concerns about consumption of residual ozone in the treated food product. It can also be used for recycling water. Fresh fruits and vegetables are washed first by ozonated water, and the wash water can be recaptured and treated by a combination of ozonation and filtration. The treated wash water is free of bacteria, color, and suspended solids and can be recycled to reduce water usage. Unlike conventional chlorine-based washing systems, wastewater discharged by an ozonation process is free of chemical residues, a growing concern related to the environment and groundwater pollution. Ozone can also destroy pesticides and chemical residues, such as chlorinated by-products. Gaseous ozone is a strong sanitation and fumigation agent and can be used to sanitize foods in the storage room and during shipping to percent bacteria, mold, and yeast on the food surface and to control insects. It can eliminate undesirable flavor produced by bacteria and chemically remove ethylene gas to slow down the ripening process, thus allowing extended distribution. For decades, it has been known that ozone is an effective disinfectant and sanitizer for the treatment of food product. It is commonly used in Europe for treatment of public water systems and food processing. It is being used in the U.S. for bottled water and has the potential for use in many food processing applications. Numerous documents and studies confirm the benefits of ozone applications in the food industry. Thus, ozone can successfully replace traditional sanitizing agents to control food pathogens. Studies have shown that ozone is fifty one percent more powerful on bacterial cell walls than chlorine, and the disinfection rate is 3,125 times faster. The fact that ozone leaves no residue in the water or on the product (it breaks down and returns to oxygen) results in no color or flavor change. Using ozone gives a higher level of assurance against pathogenic E-coli and similar organisms. Ozone, a form of oxygen created by lightning bolts during a thunderstorm, also has the capacity to be harnessed in making catfish processing plants cleaner and doubling the shelf life of catfish. These were among research findings made by Dr. Gladden Brooks, a Mississippi Cooperative Extension Service food scientist during the 20th annual Catfish Processing Workshop. Brooks disclosed that studies involving industrial ozone were in June and July 1990 at the Delta Pride catfish processing plant in Indiana. Experimenters determined that ozone was 15 times as effective as chlorine, extending shelf life by weeks, compared to the normal five to seven day shelf life. "Chlorine has proven to be ineffective in controlling bacterial growth, its use results in a poor shelf life of catfish and chlorine imposes a potentially harmful chemical on the consuming public," Brooks said. "Elimination of chlorine as the prime bactericide is now possible, along with other chemicals which may cause problems with treatment systems. Ozone offers the prospect of providing the consumer with a fish product that has added value and improved health benefits. The amazing thing is that ozone produced no after-effects and the product was cost effective to use. Ozone produces no detrimental chemical-organic reactions,” added Brooks. Ozone has been used in the treatment of drinking water since 1856 and is widely employed in the commercial beverage industries. Ozone for food safety applies to all links in the food chain - from the processor to the table. In keeping with the industry's intense resolve to produce a safe food product, using ozone will give processors an even greater assurance that their products are safe, as well as environmentally friendly. The fact that ozone leaves no residue in the water or on the product, (because it breaks down back to oxygen) means no change in color or flavor. Using ozone gives more assurance against pathogenic E-coli and similar organisms and at the same time, conserves water and extends the shelf life of the product. Studies have shown that ozone is fifty one percent more powerful on bacterial cell walls than chlorine, and the disinfection rate is 3,125 times faster. Recently, FDA and ADEC has approved the use of ozone as a sanitizer for use in food processing plants. There are two steps in most cleaning procedures. First, cleaning the surface areas and removing the organic residues in which the bacteria live. Secondly, sanitizing is done to destroy any bacteria remaining on the surface. No secondary biocide is necessary when using ozone as it kills bacteria, viruses, spores, fungi, mold, mildew, etc., without the need for other products. Processors who chill fruits or vegetables after harvest using water held at approximately 34 degrees Fahrenheit can ozonate the water to prevent contamination of the product. Cooling fruits and vegetables helps slow product respiration, and preserving freshness and quality. Studies of fruits and vegetables indicate that removing field heat as soon as possible after harvest is a critical factor in extending product shelf life. As a side benefit, ozone with filtration can remove particulates, chemicals and organics from water, settling them out by flocculation. Because it is so effective at removing suspended or dissolved substances, ozone can help conserve process water by making it possible to filter and recycle the stream. Ozone is also an effective sanitizer for air and has been used successfully to decontaminate the atmosphere in storage rooms, containers and other areas. Airborne contaminants are a concern in some food facilities or clean rooms. Gaseous ozone reacts with unwanted odors or contaminants in ambient air just as aqueous ozone decontaminates process water. The degree to which it is effective at destroying contaminants in the atmosphere or on exposed surfaces in a room depends on the concentration of ozone that can be safely used in the area. On June 23, 2001, the U.S. Food and Drug Administration officially granted GRAS (Generally Recognized As Safe) status to ozone for use in food contact applications. While there was already interest among food processors in the use of ozone for killing microorganisms and sanitizing equipment, the FDA approval opened up the opportunity for food processors to begin putting this exciting technology to use in their plants. Today, meat, poultry and seafood and produce plants are using ozonation as a food safety measure. Many food and beverage processors in the United States, Mexico, Canada, Latin America, Europe, Africa, and Asia have installed working ozone wash systems and results indicate that bacterial plate counts are lower with ozone as compared to chlorinated systems. Fresh produce when washed with ozone exhibit a longer shelf life than similar products processed using chlorine. Ozone Sanitation Technologies has theorized that ozone reacts with the enzymes released from damaged lettuce cells when this vegetable is sliced or shredded. Because the enzymes seem to be deactivated, natural browning is delayed, not only enhancing shelf life but also preserving color and flavor of the product. Vegetable and fruit tissues are not injured during contact with ozone water. Ozone is also proving to be compatible with other disinfectants. In light of continued outbreaks of food-borne illness and more recent food security concerns in the United States and internationally, as well as questions about the relative safety of chlorine, ozone is certainly a desirable solution for enhancing not only the safety but also the quality of the world food supply. The Food and Drug Administration published a final ruling in the federal register accepting ozone as an additive to kill food borne pathogens. The Food and Drug Administration amended its food additive regulations to permit ozone use as an anti-microbial agent. Published in the Federal Register, the final rule allows for ozone use in gaseous and aqueous phases, and for the anti-microbial treatment of meat and poultry. The amendment resulted from a petition, and date provided by the Electric Power Research Institute and the Agriculture and Food Technology Alliance. Ozone is Not Smog - Ozone is Good & Natural! Ozone is one of the most beneficial substances on this planet, and the BAD science you may have heard quoted on the news may be causing you to subconsciously be afraid of nature, and therefore, a part of life itself. They tell you that somehow hydrogen plus nitrogen or sulfur equals ozone. H + N + S = 03? Not on this planet it doesn't! What is ozone? Simply put, oxygen. Three atoms of nature's oxygen. It exists in a very active form for about 30 minutes before breaking down into two atoms of regular oxygen - by giving up one atom of singlet oxygen. Where does ozone come from? Nature, and nature is efficient. The new growth in the forests, the trees, the grass on your front lawn, and the plankton in the ocean are continually creating oxygen. As you read this, this oxygen is rising up into the atmosphere where the ozone layer is. In the region of the ozone layer, our rising oxygen is bombarded by the sun's photo chemical energy in the form of ultraviolet (UV rays). The UV energy bombardment changes the oxygen from 02 - two atoms of stable oxygen, into 03 - three atoms of unstable active oxygen. We call this pure form of oxygen "ozone." The using up of the UV rays to create ozone is how the ozone layer shields us from their harmful effects. This is all part of the natural process of life on this living biosphere called earth. The chemical formula for this is 3O2 > UV > 203. Being heavier than the oxygen in the atmosphere, this newly created ozone falls back to earth, eventually giving us one atom of oxygen, it changes back to 02, and is immediately replaced by more rising oxygen which is also soon changed into ozone by the sun. The ozone falls to earth and is all around us purifying our water and air, decomposing bacteria, molds and fungi. It is the fresh smell of laundry dried outdoors in the country. It is the fresh air by a clean seashore, and the sweet smell of the air after a lightning storm. Lightning, also possessing photo chemical and electrical energy, creates ozone as well. At least this is how our world was operating until man started ruining it. Ozone has always been with us in nature, and the fact that ozone gives off that single oxygen atom is a significant factor in life, in medicine, and in toxic waste cleanup technology. Thousands of physicians in Europe have been using ozone as medical treatment for over 50 years, and the use of Ozone in medicine is starting to finally catch on here in the U.S.
How is it used in medicine? This 03 Ozone is not as stable as regular 02 oxygen because it has that extra atom of 01 attached to it. Ozone will readily give up this extra atom of 01 and revert it back to stable oxygen again. This giving off of the 01 is the reason why ozone has been used in medicine. It has been proven extensively that 03 will kill bacteria, viruses, fungi and molds by attaching, oxidizing and eliminating them. Oxidizing means to burn without giving off light or heat. These bacteria, etcetera, are lower life form organisms, and are mostly anaerobic. That means they can't live around activated oxygen/ozone. Doctors using the proper concentrations and correct medical protocols have achieved substantial positive clinical results with ozone. Far from being a poison, ozone, when used properly, has been shown repeatedly to kill pathogens - yet not harm normal cells. This is because disease causing pathogens do not have any strong enzyme coatings to protect them - as do all the cells of higher life forms like humans and animals for example. Pure ozone is available to purify all our counties stored blood supplies. There is no reason why people have had to come home from the hospital with AIDS or hepatitis from blood transfusions. European doctors and respected NY University researchers all state that ozone has been used to eliminate AIDS in humans, animals and blood supplies. Without any side effects. Why don't we see this on TV? Why isn't ozone being used more widely in the US like it is in other countries? Read on to find out. Breathing ozonated air or drinking ozonated water (at the safe legal concentrations that are already conservatively laid out by the government) are two of the ways of getting activated oxygen into your body. Did you ever drink clean water just downstream from a waterfall and feel invigorated? That was because the water had tumbled over the rocks, thinned out, and absorbed oxygen/ozone from the air. Other methods being explored medically in the US are rectal ozone insufflations, ozone autohemotherapy and intravenous ozone infusions. These methods of killing viruses and bacteria in humans have been in use in European medicine for over 50 years. Most European and several major US cities have been purifying water, sewage and toxic dump sites with ozone, some for over 70 years. Ozone based systems can even break down PCB's and all other industrial chemical wastes both organic and inorganic. This is possible because ozone based systems are able to create enough of these singlet oxygen atoms to oxidize anything unnatural found in our air, water, sewage, and sediment. Ozone can do this yet is so safe that it is used on humans and animals as the water purifier at Marine World and in the Olympic swimming pools. Why does the media call Ozone "smog?" Bad science and bad reporting. Mostly because of deliberate political misrepresentation! It's also not in the best interest financially to promote the concept that ozone is good. A Los Angeles nurse that I met told me she actually treated a patient who got sick from going around breathing bus fumes deeply: The poor man had heard that ozone kills the AIDS virus and because of TV had thought ozone was the same as smog! By calling nature's oxygen "smog," and diverting your attention away from the real polluters, no one has to clean up the environment! Did you know that your automobile emits its own weight in pollutants into the air every year? Television tries to position itself as "concerned" and wastes your time arguing over what type of shopping bag you should lobby for at the local supermarket. Meanwhile, the factory next door continues its deadly course of spewing tons of poisonous pollutants into your air and drinking water. While you are constantly made to feel guilty about every day living, they won't give any significant air time to cover the far more dangerous industrial polluters that are too cheap to put scrubbers on their smokestacks. Why? Because the corporations might be "offended" and have to pay to clean up their mess. Go into a city, look up, and taste the dirty air you're breathing. Try and tell me that the brown / gray / yellow color is ozone. I doubt that I'll believe you. All of this can be cleaned up with colorless, clear ozone. Ozone based systems are able to purify 99% of every liquid, gas or toxic substance coming out of any industrial operation. The engineers even tell me we can include radiation in the list since the radiation is carried by something. Why isn't some type of ozone system being used? Nature constantly works through the balancing out of different electrical, magnetic, and chemical charges. When man dumps pollutants into the air, nature tries to clean it up by in effect creating and "sending" ozone into the affected areas to oxidize and clean up the pollution. What got us into this mess was the old idea that the earth and water and air magically combined into one giant "sponge," where we could just "toss it out" and it would all disappear. Well our sponge is full now, and although nature still tries, the ocean polluters and rainforest clear cutters have significantly choked off nature's means of cleanup - Ozone! That is why Ozone is always found as a very tiny component of air pollution. Here we find out why the newscasters and scientists try to blame your respiratory problems on your "friend ozone" and call her names like "smog." You can almost hear them thinking..."Well boss, here's 5,000 pounds of toxic hydrocarbons and nitric compounds coming from our factory, and those pesky environmentalists are starting to notice it and make noise...Let's see...There's less than .12 parts per million (or only 12 millionths of a pound) of ozone in the area...I've got it J.R.! We'll blame the "teensy weensey" little ozone molecule - so the sheep won't notice our toxic soup, the real cause of their dead trees, lung, eye and throat irritation!" "Smithers, that's brilliant! Let's do lunch at the club." By blaming nature, the huge polluters are never forced to take responsibility for the current dirty engine designs and factories, and never have to incorporate any of the already invented clean energy sources. What they call "ozone smog" is a toxic soup of compounds. Why they don't tell you is that Nature's ozone is trying to clean it up, and is a very tiny portion of the smog they report. THE MORE CHEMICALS DUMPED IN THE AIR, THE HARDER NATURE TRIES TO CLEAN IT UP, THEREFORE THE REPORTED OZONE LEVELS WILL BE HIGHER. They also don't admit that pure ozone is strictly, always, only 02+01 pure oxygen, and never anything else. The ray of hope here is that the media professionals and federal, state, and corporate decision makers and their families are themselves coming down with all manner of new mutant diseases. Their vacation hideaways are spoiled. It is no longer an "us" versus "them" class struggle. We are all in this earth boat. This is quickly forcing change in "business as usual." As to their claims that ozone is smog, I can refer detractors to internally clean people who work in very high concentrations of pure ozone all day long without any ill effect. In fact, they commonly report a healthy invigoration. Where these scare stories come from is the following typical scenario. When a typical smoker, or junk food or drug addict - a person whose body cells are loaded with toxins finally gets near enough to an activated oxygen (ozone) source, his or her body starts to oxidize the toxins within it, in an effort to finally remove them. The pathways out of the body become filled with cellular debris, swollen, irritated, and fluid filled. Often this is uncomfortable, but only for a few days, while, and until, the oxidized toxins leave the body. The health professionals skilled in medical ozone usage call this a "typical detoxifying cleansing reaction"that will generally subside within a few days. Most air ozone "studies" are halted at the point of detoxification discomfort, and not after the full cleansing has occurred. Therefore "negative reports" is erroneously reported in the scientific literature. In contrast, any properly conducted experiments are allowed to continue past this point - and report how the body replaces the weak, old, diseased, dying, feeble cells with new and very healthy oxidative stress resistant ones. At times, an isolated and questionable report will surface in the scientific literature, telling of animals exposed to ozone who developed lung irritation. These studies were usually done at SUPER HIGH concentrations, way beyond the suggested typical medical Protocols! I've actually cornered a few scientists and reporters and asked if they knew that they were not being scientifically accurate when in the press they equate ozone with the toxic soup of smog. The admitted (in private) that they knew they weren't, but keep up the charade "because everyone else does!" What about the holes in the ozone layer? Consider the gluttonous "clear cutting" of the oxygen producing rain forests and the disappearance of our own oxygen producing national forests. Where is our oxygen going to come from? Then add the constant selfish polluting of the oceans and the greedy discharge of industrial pollutants, nuclear radiation and electrical energy into the atmosphere. These electrical, electronic, and radioactive discharges further scramble the elements in natures air. At home, chlorine gas comes out of your water faucet and rises up into the sky. More and more, our oxygen is either missing or bound up in toxins. What we're experiencing is an increasing shortage of atmospheric oxygen that's available to be turned into ozone in the first place! That's why there is an ozone hole at both poles and the rest of the ozone layer is starting to look like Swiss cheese. Greed, not ozone is the problem! The ozone layer is constantly changing, almost a living boundary, paper thin, and missing at night. When the oxygen is all bound up with toxins, then there will be no ozone layer. Without available oxygen, the sun's ultraviolet light passes right on through without being absorbed in creating ozone, and we are seeing increased cataracts, skin cancer, blindness, and burning of vegetation. So our bodies and our food supply - therefore our very existence - is in danger, unless we personally do something about turning back the rampant greed that is destroying us. What can you do to help preserve and re-supply the missing oxygen in your life? Stop those unevolved people who think "We're all going to die anyway so I'm going to get all I can now" from cutting down all the trees. Convince the factory managers to install existing devices like ozone based smokestack scrubbers, factory discharge point ozone based purifiers, and to fund existing ignored clean energy sources. Plant lots of trees. Don't sell aerosols. Stop polluting! Industrially, ozone air purifies have been in use for decades. There have been no problems associated with their use, as long as they are used in average sized rooms, at the recommended government established safe healthy levels. Enlightened hospital operating rooms commonly use ozone air purifiers to keep everything sterile The doctors and nurses aren't falling over dead are they? Ozone air sterilizer/purifiers/deodorizers are commonly used: by hotel chains to remove odors; by used car dealers to give old cars that "new car smell"; by morgues to get ride of formaldehyde odors; by schools when they refinish a floor, so they don't have to close the school because of the dangerous refinishing chemical odors; in bars, comedy clubs, and restaurants - so the majority non-smokers can patronize them again and go home without stinking like an ashtray; in fitness/exercise clubs and gymnasiums where patrons don't smell body odor, they only smell fresh air and report increased endurance and strength; by grain storage building owners who report an end to mold and rot. Owners of animal excretion soiled stable, barns, veterinary kennels, and professional dog and horse racing paddocks love them. If the animals could talk, they would probably echo this sentiment, and describe the air as fresh as a day in the country. Entrepreneurs even buy - at a discount - sick cattle that are worn out from antibiotics and drugs, ozonate their air and water, and then sell them as healthy, disease free animals a year later at a profit. Plus, the consumer eats chemical free meat. Do you have any smoke damaged goods? Fire damaged furniture? Stick it in a room with an ozone air purifier running full tilt, and in a few days the useless items are restored. The applications are endless, wherever stale, polluted and toxic odors are encountered. Factory and closed-up-tight office workers could ask management to install ozone air purifiers. Management would benefit at the bottom line, because happy oxygenated workers are more efficient workers, cheerier to customers, and don't need as many sick days. In the fifties, ozone air lamps were placed in schools, and absenteeism dropped. Commercial clothes dryers came with UV ozone lamps in them. The federal government required their use in all government restrooms. If your home or work air stinks, think of ozone solutions! If a foolish person sat only inches from an ozone generator on full blast and breathed deeply for a long period of time, they might have cell lysis (destruction) problems. But no one is advocating doing that and anyone who does this has too much time on their hands! "Ozone is smog" is a great, quick, one liner for the media to hype, but it is far from reality! This "instant journalism created hysteria" is so bad that the "Earth Day" environmental organizations even emblem their signs with well meaning but uninformed slogans. In a twisted way, people subconsciously are made to fear the very act of breathing, so that every breath taken on a hot summer day in the city is tainted with a fear of life itself. At the home level, many thousands of people are now exploring the many medical oxygen therapies and pollution control devices. One of the simplest methods of using ozone at home is by installing a home ozone air or water purifier. They do a fine job for what they were designed for, general air and water purification. After installing air ozonators, many claimed "their house mold went away," "the odors stopped," their "emphysema became less," or their "lupus got better"! Sounds fantastic, but hearing these stories first hand has been my experience. Of course no one is making illegal medical claims for these devices, but the anecdotal evidence in this area continues to amaze me as it piles up steadily. Since anaerobic (most) disease organisms simply cannot exist in oxygen, than oxygen is the first line of defense in your immune system. It's also necessary for the removal of every single bit of toxic waste in your body. Every waste product that comes out of you is oxygen combined with hydrogen, nitrogen, sulfur, or carbon. If the toxins in you don't have any available oxygen to combine with, they pile up inside you and they can't leave and eventually you get sick. Dr. William F. Koch, MD., was a brilliant free radical chemist and former professor of chemistry at Wayne State University. He wrote that ALL disease originates from toxins in the body. Now think about the fact that we were genetically designed during a time when the atmosphere was 38 to 50 percent richer in oxygen than you now live in - especially if you live in a city. We are living way below our optimum efficiency. If your car has dirt in its oil, has half its air supply cut off, and has never had an air or gas or oil filter changed, it will die after sputtering along for a while. Our bodies are vehicles for the Soul. Your liver and kidney and lymph system are the vehicle filters. You die too soon, and full of dirt as well. The Bible dates some in the old Testament as being over 900 years old. How did dinosaurs get to be 5 stories tall? You can guess why so many are sick so often in our "modern" society. I am convinced that what we've been presently experiencing in our society is the rise of the age of toxins, diseases, and plagues all corresponding to the fall of our planetary and body oxygen levels. Fueled by greed and self imposed ignorance, the phenomenon is sad indeed, and unless abated, will drastically change or even eliminate life on this planet. Some, including doctors, have added up the numbers, and concluded that half of the world's population will possibly be dead from AIDS, alone, in the next 20 years. I have seen slides brought back from Africa by Dr. William Douglas, the book author. Slides of whole villages that are now empty, and roads lined with burial mounds where the victims fell. Not a fantasy, it's real, it's right now, it's your/our problem. Pay attention to the warnings. Take heart my friend, if you're reading this, it's not over yet. We can help change above dire predictions, if YOU get involved at some level. Plenty of evidence exists proving that an increase of planetary and cellular oxygen levels will solve most of our life threatening industrial and medical problems. The bottom line is...Ozone is our friend. We should get to know it better! Note: This article is for general information purposes only and not for medical advise or for product endorsement.